2011, Hb, 388pp., Illus., Appendix, Biblio. Today Indian Music has won a place of pride in the global musical heritage. 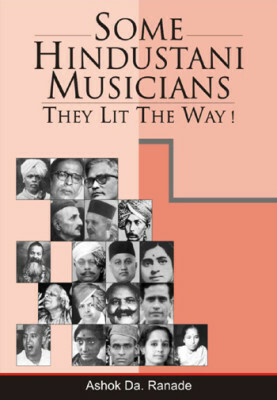 Hindustani classical music and its vocal stream have been major influences in creating the larger Indian musical tradition. Music being a performing art, lives in performance. These performances are obviously realized through performing ideas and their exploration by artists concerned. The identification of performing ideas provide the prime clue to the qualitative forces in any artist\’s work. Dr. Ranade has attempted to identify and analyze 19 major performers\’ performing ideas as they became accessible to him in mehfil-s, recordings or teaching sessions. Four other musicians are also briefly discussed. These music-makers — and of course others not discussed here — have lit the 20th century, i.e., our immediate and adjacent living past. Hence the special contemporary quality of their work. They belong to different gharana-s and language-regions and the variety of their approaches is a challenge as well as delight. About the Author: Ashok Da. Ranade is a vocalist (Hindustani Classical), composer, musicologist, ethnomusicologist, voice-culturist and a teacher with degrees in literature, law and music.